Sorry to get back on topic, but I just listened to my new DYI cables for about an hour and now they seem a bit bright. Getting back to my earlier question, do speaker cables need time to break in? What I hear now is reminiscent, but now as bad, as when I had my XO's rebuilt and upgraded to RDO194's. Back then the sound was bright and even a little raspy. After about 200 hours, as per F1's advise, they were completely settled in and now sound great. Now with the cable switch, so far, I feel like I am back there again, a bit. Should I wait awhile before passing judgment, or is this a case of it is what it is? Wire, the metal conductor part of a cable, does not break in, but the dielectric properties of the cable insulation can change over time. This has to do with the ability of the cable insulation to store and release energy - an cause noise and distortion. To hear differences in audio equipment or cables, you need to be using components that are of a level that the typical stuff from Best Buy can’t touch. You're being elitist and an audio snob. I would love to see your analysis on the effects of high performance audio cables on entry-level AVR’s, DVD players and speakers.... should make for a fun read. Insulation is supposed to prevent interference with signal transmission. If it is coloring the signal then that is a problem. There are times when a polarizing insulation is important. Things like radiation barriers or certain kinds of antennas. Otherwise, a dielectric is better suited for things like capacitors where they don't work without it or like in phase shifters, voltage controlled oscillators or tunable filters like what is used in certain radar systems where the dielectric properties improve performance. In audio, a clean, unfettered, unmolested signal path is the desired result. Wire insulation that has dielectric properties strong enough to create signal abnormalities that manifest in audible manners is undesirable insulation. All insulation is going to have an effect of some sort but to deliberately choose a material for insulation that has a dielectric property that creates force of any kind on the signal path is the exact opposite of what a wire should be doing. If you have cables that are doing that, you need to get different ones because that is a failure, not a feature. Even if it was intended by design. Might disagree there John. Nice theory, but in practical use it doesn't hold water because everything in the chain effects the sound in some manner. Change the internal wiring in your speakers and the sound changes, doesn't mean the new wire is broken, just that it has different properties....and that will effect the sound. From the recording to your ears, the signal path has been molested numerous times. Between the gear playing it, the source, the pre, the dac, the amp and the speakers along with every interconnect and speaker cable used. In audio, one camp certainly professes a shorter signal path is the best, for the reasons I just explained in the previous paragraph. Less gear, less cabling, shorter path, may indeed grant you a better sound, in theory anyway, but as we know sound is not a one size fits all game to play. It could be said, everything I just mentioned is simply coloring the sound, and you'd be right. However, coloring the sound plays into personal preferences and one's idea of what good sound should sound like. If nothing molested the signal, in a perfect world, every CDP would sound the same, every pre/dac/amp, cables, and even speakers to some degree. Bottle you say? Whats this? I thought it only came in square? Don't you boys get me started on wine. Actually I can relate wine to the thread topic. Some say they can't taste a difference in wine, good, you saved yourself some coin then. Same with cables. Some say wine's characteristics are defined by various things such as the type of grape used, the ground it's grown in, climate, storage temps, aging, etc. Everything matters in the chain of processes to the final taste that hits your mouth. Cable building also has a few processes involved, and pairing those characteristics to those of the associated gear will give your ears the best taste of sound defined by your preferences. Some people are happy as a clam drinking cheap wine, pleases their taste buds and they see no reason to spend more. Others may have a more demanding taste bud and like the more expensive wines. Cables are no different. The commonality, is personal preferences, which dictate what we buy, what we use, what we listen to. In order to please the various differences in preferences, we have a variety of products to suit any of them. So yes, in food, wine, and audio, everything colors the sound, tastes, to please the end user. Nothing else matters to that one persons preferences. But Tony.......................what about expectation bias??? If you buy an expensive bottle of wine IT HAS TO TASTE GREAT, I mean.............you're expecting it to. Even if it tastes like vinegar your "human factor" is going to trick you into liking it because it cost so much, RIGHT!!! LMAO at the whole expectation bias. If anything, for me, I am even more critical of something I have high expectations for. So that theory just doesn't hold water in and of itself, atleast for me personally. For the many things I am well versed in or have dialed in particular preferences, expectation bias is a non-starter. By nature I am analytical and skeptical to the point of annoyance to those around me when it comes to choosing anything, albeit audio, wine, steaks, craft beer, etc. And I am a cheap skate in the fact that I like things that are a good value. Anyone can go pick out a great $100 bottle of wine, but I prefer to find that $30-40 bottle of wine that tastes very similar if not almost exactly as good as the $100 bottle of wine, as an analogy. I've told all y'all my Boones' Farm story, right? Then comes the baaad night. Consider those wine choices the equivalent to Home Depot copper speaker wire! If anything, for me, I am even more critical of something I have high expectations for. Unfortunately, there seem to be many incapable of obtaining that skill level as it relates to audio and life in general. SPEAKER wire.... my bad, I thought this was about SPEARKER cables, and everybody knows those all sound the same. 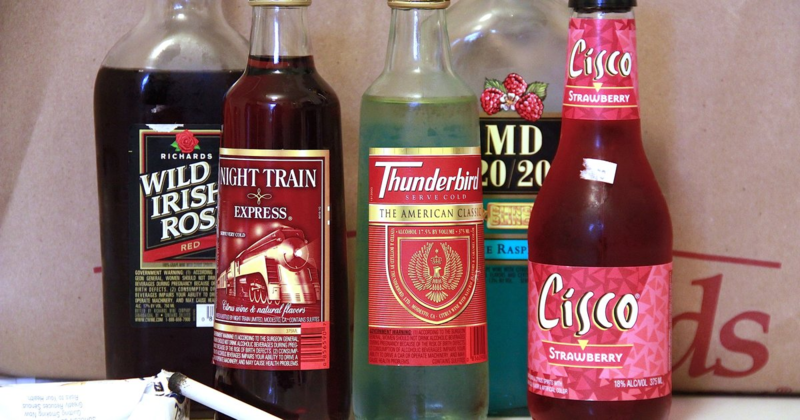 I've got a few college stories about Boones Farm also. Yep, I'm more critical of nicer more expensive things also. Everyone has a certain expectation bias, but one must deal in reality also. Sometimes I have a higher than normal expectation, and a piece may exceed it., or fall flat on it's face. Sometimes I have a low expectation, and am pleasantly surprised. I just call them as I hear them, no matter if it's my money or someone elses. I agree with this, and I certainly feel it produces an audible result. Wire insulation that has dielectric properties strong enough to create signal abnormalities that manifest in audible manners is undesirable insulation. All insulation is going to have an effect of some sort but to deliberately choose a material for insulation that has a dielectric property that creates force of any kind on the signal path is the exact opposite of what a wire should be doing. You are correct that wire insulation that has dielectric properties strong enough to create signal abnormalities that manifest in audible manners is undesirable insulation. The problem with the best dielectric materials is that they are impractical or prohibitively expensive for mass production. This is why telecommunications companies have spent so much time (decades) and money (billions) researching cable insulation materials that have a good trade-off among cost, ease of manufacturing, ease of installation, and ease of maintenance. The best dielectric is vacuum (dielectric constant of 1). Second best is air (dielectric constant of 1.00059). Then we get into the better polymer dielectrics like Teflon (dielectric constant of 2.1, cost $3-$10 per pound). Dielectric performance diminishes after after vacuum, air, and Teflon, although polyethylene is close to Teflon with a dielectric constant of 2.25 (cost ~ $1.30 per pound). Vacuum and air are essentially "free", but maintaining a vacuum enclosure and an air enclosure costs some time, effort, and $$$$. My AudioQuest Sky Gen 2 interconnects use large Teflon tubes filled with air to insulate the silver wire conductors. My AudioQuest Everest speaker cables use carbon-loaded polyethylene insulation around the silver wire conductors. In addition to the low dielectric constant wire insulation, the insulation has a Dielectric Bias system to keep a static electric charge on it to further reduce energy absorption and dispersion. Electrons take the path of least resistance already present in a conductor. They do not create a path of least resistance. Molecular motion and random electron motion actually impede current flow. Unless the current is high enough to heat up the wire, the conductive crystal metallic structure of a wire is not going to change over time due to a current flowing through it. Electrons do not "chip away" at metallic obstructions in a conductor the way that water "chips away" the sides of a river bank. The way a wire is drawn, milled, polished, twisted, and formulated can affect the sound. A wire can have better conductivity in one direction than the other. But again, these things do not change with time and amount of use. That's something I'll investigate in the future...when I am more dedicated to audio than I am now. In the meantime, you should go over to one of those popular anti-audiophile forums where it has already been scientifically proved with quadruple blind testing that all cables sound alike. I will tell you though, that even back in my college days of Bose speakers, Kenwood speakers, Cerwin Vega speakers, Baby Advent speakers, Kenwood receivers, Sony receivers, cheap Sony turntables, and cheap Shure cartridges, I could hear a big difference between zip cord and Monster speaker cable and between those flimsy, spaghetti-string stock interconnects and Monster InterLink interconnects. Nostalgia! At left, a pair of Monster Cable InterLink 400 interconnects that I purchased for my first nice stereo system in the late 1980s ($30, for 1 meter pair). At right is a spare pair of AudioQuest Sky Generation 2 interconnects ($2900). Thirty dollar cables was really, really, expensive compared to the free cables that came with gear. I usually don't sell interconnects that were in my system for a while. 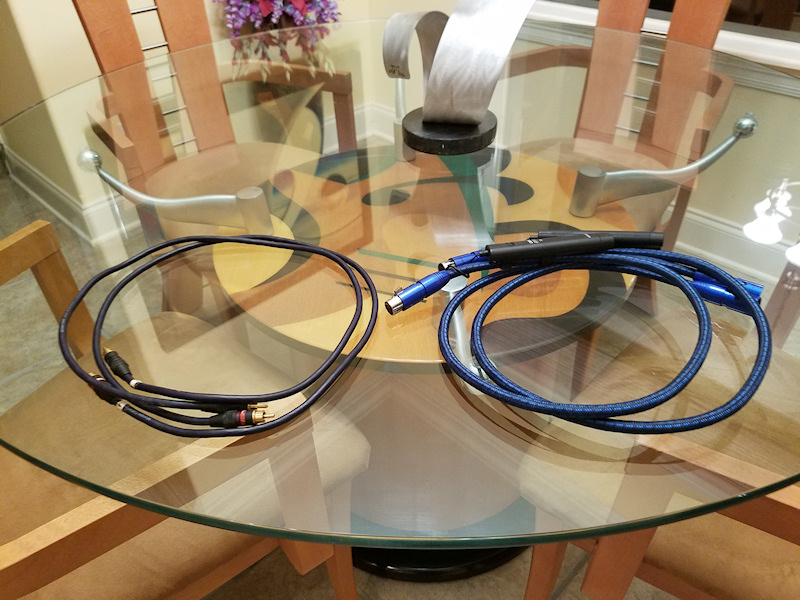 Sometimes I buy cables out of curiosity, but I quickly resell those after evaluating them. I have three different levels of Monster interconnects (and a few other brands) that I use in cable performance demonstrations. Over the years, I came to understand that cables were another important component in the music chain, rather than just mere "wire". This is the reasoning I don't like and is probably why people discount the fact that cables don't matter. There comes a point where the improvements you hear is more because of marketing, a fancy pseudoscience buzz word, and the fact that if people pay a lot for something they believe it sounds better. Think $14,000 jumpers. For the record I am cable believer..........I heard it. BUT, Does anyone wonder why they price cables the way they do. Look at Audioquest. They have a price range for every budget and at least a 1000x range in price. Do you think they pay 1000x more manufacturing the cable? They all use basically the same components. Add to that all of the different cable designs by the different companies. (solid wire, litz, pure, monocrystalline and silver, even silver plated). Each line claims to have the best sound and will always have improvements if you work up their line and pay enough. So you can design a cable with any design or different components under the sun.........And in all cases the more expensive cables always sound better? This is the part where I call BS. There are wires designed for very specific and mission-critical applications used in aerospace for example, that must meet very specialized criteria, and are extremely expensive to design and manufacture. I can assure you that not all components are basically the same. Cardas has some crazy machines that they spend quite the coin keeping maintained that contributes to the different cable geometry's they manufacturer.